Over the years our Managing Director Chris Pyak had the chance to work with extraordinary professionals. They came from all over the globe and a wide variety of professions. Here you find some of their feedback. 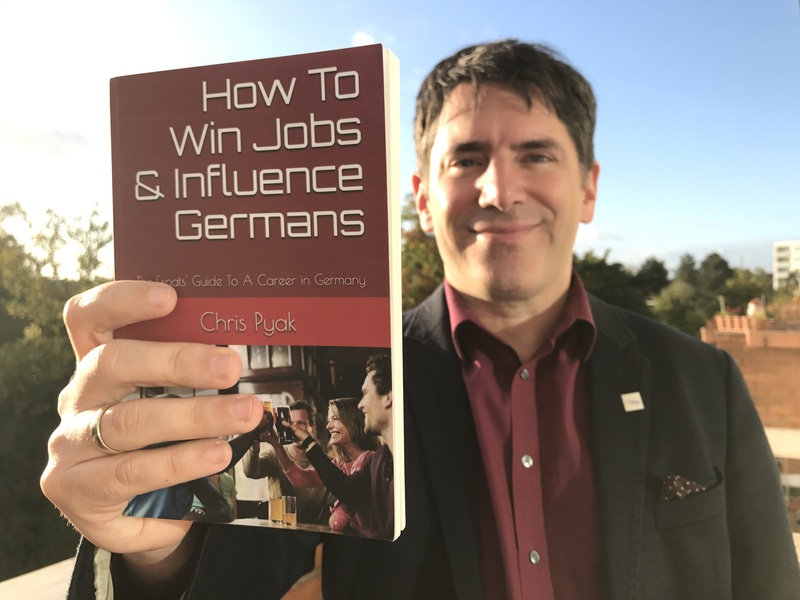 Chris’ used his experience with thousands of expats and hundreds of German managers to write “How To Win Jobs & Influence Germans“. If you “don’t fit the ISO norm” because you are an international professional, “too old“, “too inexperienced“, “to female (might want children soon“) or simply so much better than the average: Please book an individual consultation. Together we build a road towards your next career step. I got two job offers. It took me more than 6 months to get here.I never thought I would end up with multiple opportunities in the month of December and during Holiday season. And I Thank You of course for all the support & motivation & guidance during the process. I just would like to inform you that i found a job. I’m really happy since this is an interesting position and in the same industry that I’m used to work with. Thanks once again for the useful tips that you provide in your book. Chris….. I got a job… Through my connections.. Thanks for encouraging me and inspiring me to keep fighting and getting in contact with all possible people who could help me!! “One eye opener is surely the chapter on why we Germans value punctuality so much. This chapter alone is worth buying the book – also for Germans!” Read Dirk’s full review. “Pyak argues that the German trait of being risk averse is very pronounced in HR departments.” You can find the interview here. Get “How To Win Jobs & Influence Germans” at Amazon. My column about Merit Germans has been published by Die Kolumnisten. Hello Chris, Hope you do still remember me Just want to let you know that I got a job offer! You are right, we (foreigners) just don’t know the correct way to approach German employers, but we are not inferior to any German applicants! Thank you, Chris, for your useful tips! Would you like to get advice for your career in Germany? Would you benefit if I introduce you to managers in my network (that you consider useful contacts)? Please book a consultation here. My new book “How To Win Jobs & Influence Germans” is a step by step guide into the German jobmarket. It is available at Amazon. This experience is worth reading in more detail! I bought your book how to win jobs & influence Germans. It is very helpful and i got good insights about the best way to approach the hiring companies. “How To Win Jobs & Influence Germans” is available on Amazon. Jens Spahn is a conservative politician who rants against English speaking foreigners. My response was part of today’s article in The Local. If you would like me to guarantee that you get a job offer within six months: Please book an appointment here. Nicht nur Expats, sondern auch RePatriates haben oft Schwierigkeiten wieder in den deutschen Arbeitsmarkt zu finden – trotz erstklassiger Erfahrung. Ich bin froh dass ich Martin helfen konnte. Mein neues Buch “How To Win Jobs & Influence Germans” ist jetzt auf Amazon erhältlich. A while ago I had the opportunity to give some career advice in Russian. Here is the article by Deutsche Welle Russia. A few mistakes have made it into the article. For example: I didn’t live “several years” in Moscow. I lived many years in East Europe and also (for a while) in Moscow. “If Germany wants to withstand the global competition, says Pyak, it cannot expect all specialists to speak German. Instead, it needs cosmopolitans.” Our managing director Chris Pyak comments on labour shortage in the German newspaper Berliner Morgenpost. Chris’ new book “How To Win Jobs & Influence Germans” is available on Amazon. Message from Maria on the release of Chris Pyak’s first book “How To Get Jobs & Influence Germans“. If you would like Chris Pyak to guarantee that you get a job offer within six months: Please book a consultation here. In addition, the participants listened to a high-profile speech by Chris Pyak from Düsseldorf on the topic of demography and internationality. I forgot to tell you that I was offered a contract in München 3 weeks ago. It was a big accomplishment achieved to a large extend due to your help. So, I just wanted to thank you once again. fitted to my experience. Then I’ve decided to take it. If you need help pushing your career in Germany to the next level: Have a look here. “Being from North America I was unfamiliar with the interview process in Germany. With Chris’s help I was able to identify what I really wanted and how to quickly determine what potential employers are looking for. I learned the best way to conduct a job interview, which are the best questions to ask and how to make it easy for potential employers to present me will a job offer. Being part of the contributors circle was also very important for me. “Die Seminarreihe von Chris Pyak stieß bei unseren Mitarbeitern auf große Zufriedenheit und Akzeptanz. Über 90% der Teilnehmer bestätigten, dass das Training ein voller Erfolg war und empfahlen den Trainer für weitere Seminarreihen zu engagieren. “Hello Chris, I would like you to thank you for your help. The jobs posted on your page as your advices, proved very handy. I have a job offer and I am moving to Germany. Besonders gut hat mir am Seminar der hohe Praxisanteil gefallen. Der größte Nutzen für mich ist, dass ich jetzt Deals schneller closen werde. Was mir sehr gut gefallen hat: Das Seminar war sehr persönlich. Kleingruppen bringen den höchsten Lerneffekt. Ich habe bei Chris Pyak viele Dinge gelernt die ich in meinen Reden nutzen kann. Hallo Chris, dein Seminar hat mir gut gefallen, da sich alle Tips auch außerhalb der geschäftlichen Kontakte super anwenden und”üben” lassen. Hallo Chris, es ist nun gut 6 Monate her, dass wir uns in Düsseldorf kennen gelernt haben! Damals sollten wir ein Ziel festlegen und dieses vortragen. Ich glaube, dass ich für diesen (oder einen anderen) Vortrag sogar einen Preis erhalten habe. Ich wollte bis Ende Juni einen Vortrag vor Unternehmern eines Verbandes zu meinem Thema der Nettolohnoptimierung halten und entsprechende neue Aufträge erhalten! So, der Gedanke war gepflanzt und letzten Montag war der Vortrag vor Unternehmern des lokalen Unternehmensverbandes. Üblicherweise nehmen zwischen 20 und 30 Unternehmer oder “Personaler” an diesen Veranstaltungen teil, Montag waren es über 50 und die ersten 2 Rückläufer hatte ich innerhalb von 24 Stunden! Danke für das Coaching und die Pflanzhilfe. Ich freue mich auf das nächste Zusammentreffen, man sieht sich ja meistens öfter als ein mal im Leben! Claudia Fander, Geschäftsführerin Claudia & Roland Fander GbR. “Mit Training von Chris Pyak habe ich es geschafft in wenigen Stunden mehr als zehn Empfehlungen von Bestandskunden zu gewinnen. Vorher habe ich mich nie getraut nach Empfehlungen auch nur zu Fragen”. Would you like to discuss your career challenge and goals in an individual consultation? Please book a consultation with me here. Find (nearly) every English job offer in Germany. 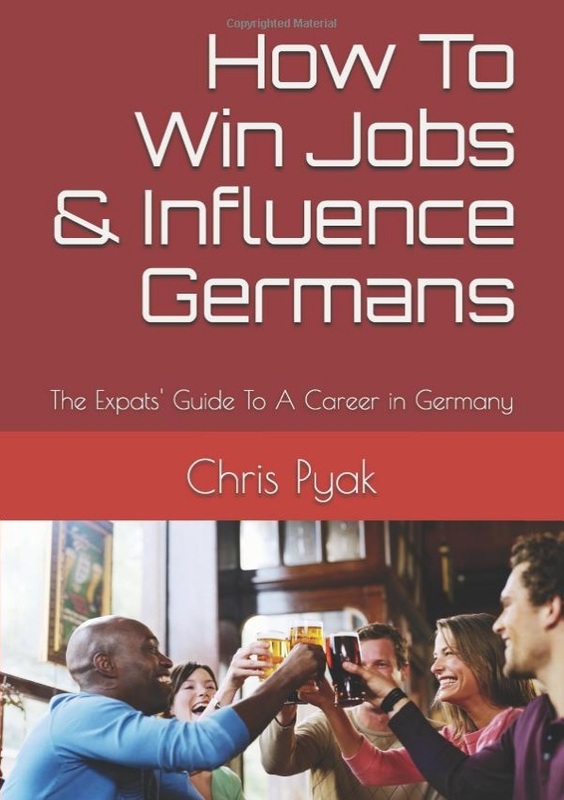 Read editorials by Chris Pyak, Author of "How To Win Jobs & Influence Germans"
Join LIVE podcasts with German employers who hire in English. Help a friend's career & share!